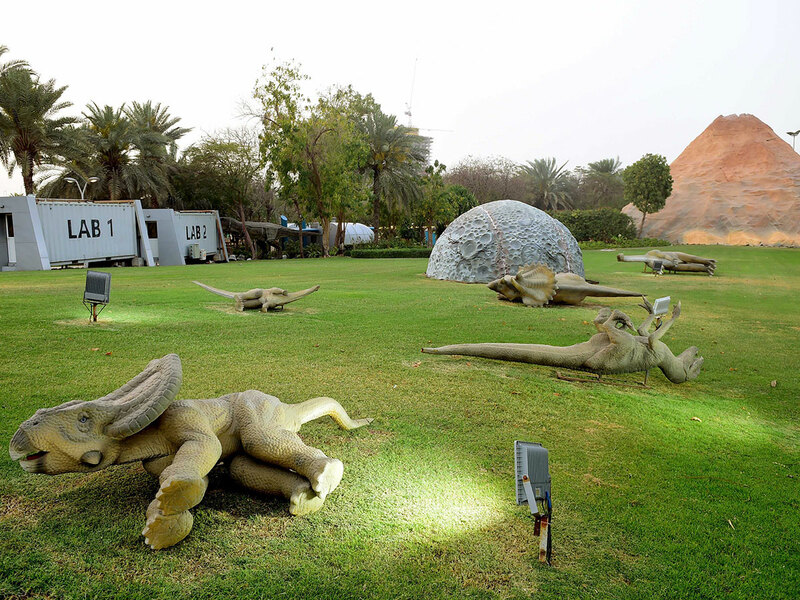 A visit to Dubai Garden Glow’s Dinosaur Park can spark interesting conversations. From the obvious questions about the sheer variety of species (more than 700 types of dinosaurs have been discovered so far), their size, diet and habitat, to a look at the bigger picture of evolution and extinction, the park offers a learning experience for everyone regardless of age. For children, Dinosaur Park brings to life the giant creatures they have seen in books and movies, while for adults, it’s a chance to refresh what they have learnt. Starting with pre-dinosaur reptiles such as Placerias and Dimetrodon, the park takes you systematically through the age of dinosaurs, from its evolution in the middle Triassic about 230 million years ago and the Jurassic, to its extinction in the late Cretaceous, 66 million years ago. Apurva Bhansali is at the park with his children, 14-year-old Viha and nine-year-old Rayna, and their friends, Prapti Doshi, 9, and Rehaan Doshi, 8. To his delight, the visit has turned out to be an educational and entertaining experience, with the children totally engrossed in the dinosaurs. The girls were impressed that along with the names, the information boxes also spelt out what those names meant as well as the time and the region they lived in. Shaesta Rawat and Sufyan Seedat are at the Dinosaur Park as a Mother’s Day treat for their three-and-a-half-year-old son, Haaris Seedat. “It's been a really good experience,” says Rawat. “We managed to see a lot of dinosaurs. My son's been able to explore the park. We have been able to talk about the different species of dinosaurs. 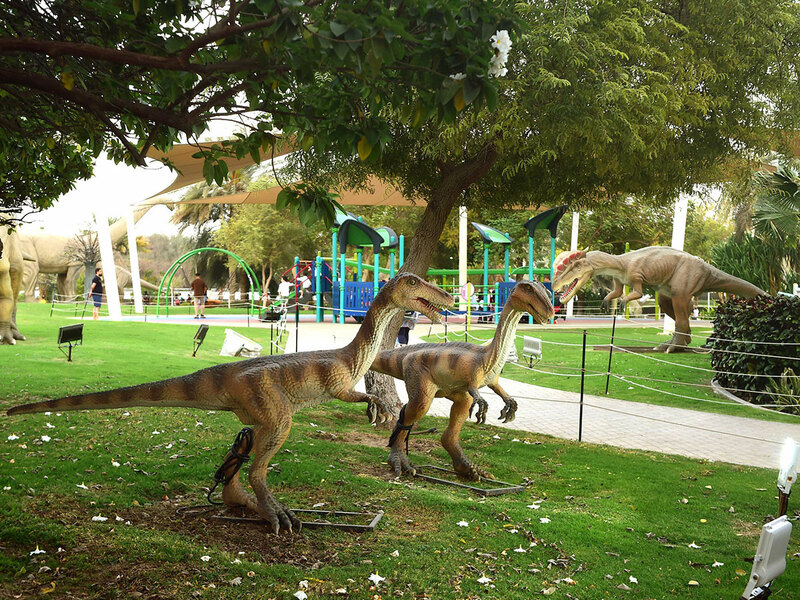 Rawat believes the park would also be a great hit with adults who have a huge interest in dinosaurs. 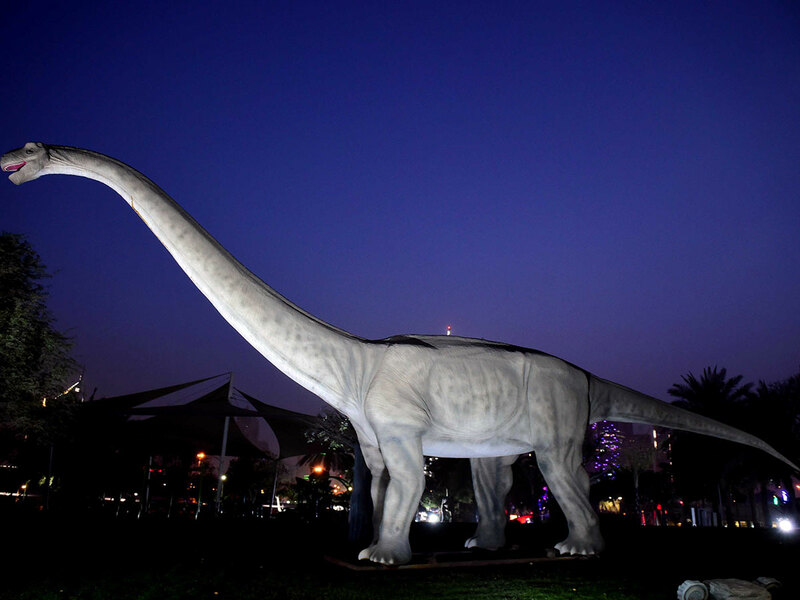 A big fan of dinosaur movies, Preeti Chopra, who is visiting her sister, Shruti Mehta and her family in Dubai, is keen on dinosaurs. 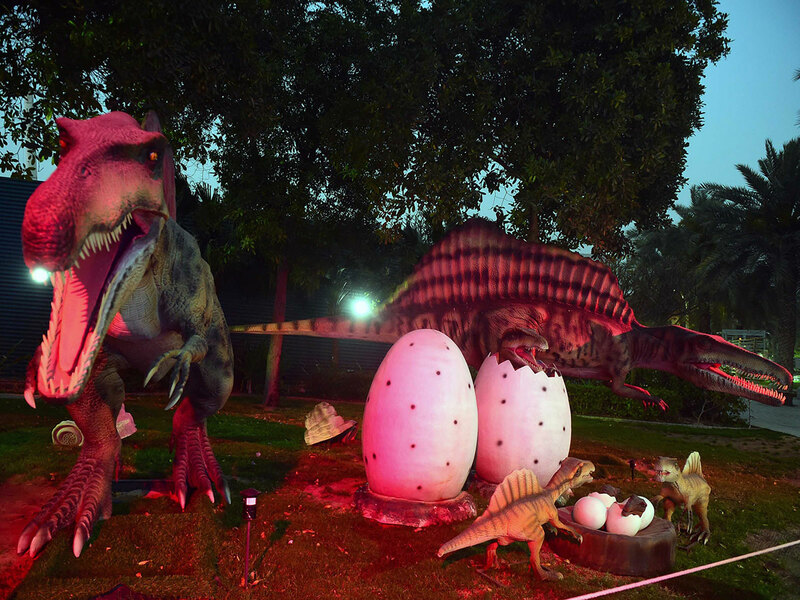 “The park is a huge attraction because you don't usually get to see dinosaurs like this, and there are so many different varieties,” says Chopra. “I don't even know the names of some of the dinosaurs. So it’s a good learning experience. “And I got to know who all are vegetarians and who all are non-vegetarians! When Roby Roy, 14, and Ruby Roy, 12, handpicked the Dinosaur Park to celebrate their school holidays, parents, Bindu and Roy Thomas, were only happy to oblige. "Roby has been on the wheelchair for the past five to six months,” says Bindu. “So, it’s a good outing. This is a nice place and it's easy to take him around. And the climate is also very good." But what he was most thrilled about was seeing his favourite dinosaur, the ferocious T.rex in all its glory. Seven-year-old Alvaro Granda Santos, who is at the park with his parents, Susan Santos and Roberto Granda, and baby sister, Ana Marina Santos, knew very well what he wanted to achieve from this visit - to learn about prehistoric life in a real-life setting. Although he has gathered a lot of information and even got a new favourite, Brachiosaurus, he isn’t exactly sure how the dinosaurs went extinct. So then, a visit to the Dinosaur Park is not about instant gratification alone. It also whets your curiosity to explore the life and times of these magnificent creatures in depth.